Modern brides love this chic Malmo flatware from kate spade. Sloping, tube-like handles give this pattern its contemporary flair. In dishwasher-safe, tarnish-resistant 18/10 stainless steel. Featuring precision lines and unique, tubular handles, kate spade new york Malmo Gold 5-piece Place Setting reinvigorates modern dining. 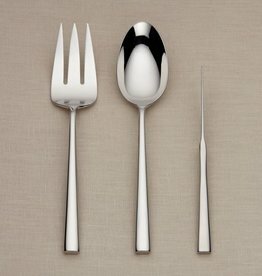 The golden color in 18/10 stainless steel evokes a richness that makes this flatware an elegant addition to any table. Includes cold meat fork, butter knife, and tablespoon.